The only way to ring in Christmas is with an enchanting, ladylike and loyal wrist candy – one that sparkles with the season, and one that dazzles just like Emporio Armani’s holiday range. As the pioneering line of Giorgio Armani, the sleek collection was designed with uninhabited spiritedness and dynamic evolution in mind. Constantly innovating and updating its styles, the line pushes the frontier of the time-honed art of watch-making. From my years in the fashion industry, I know for sure that trends come and go – yet Emporio Armani constantly expresses itself in a new metropolitan language; keeping its alluring classic aesthetic while redefining fashion’s current trends. I simply and quite literally could not take my hands off their Gianni T-Bar watches. 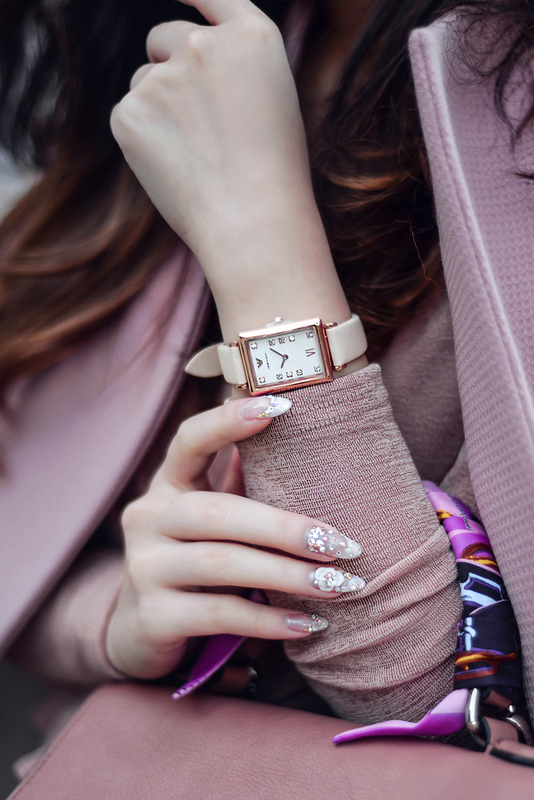 Notably, the largely successful piece has been re-imagined in several exciting new ways including a slender rectangular case for the first time The elegant white matte dial, studded with 10 bedazzling crystals is set in a rose-gold plated petite frame. 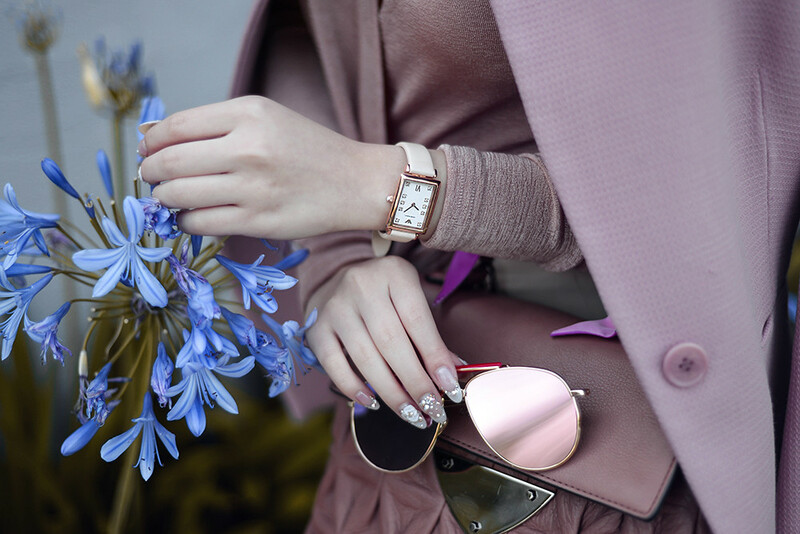 No doubt the unabashed femininity is clear in this piece; its slim lady-like silhouette and light peach leather strap complement the watch’s rose-gold body. 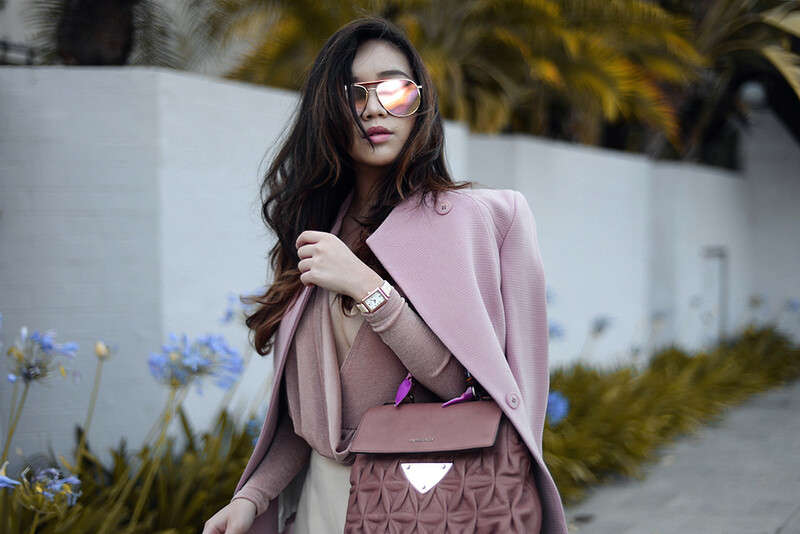 With this inspiration, it was only apt to style the time-piece with matching baby-pinks and soft colors for an ultra-feminine feel. 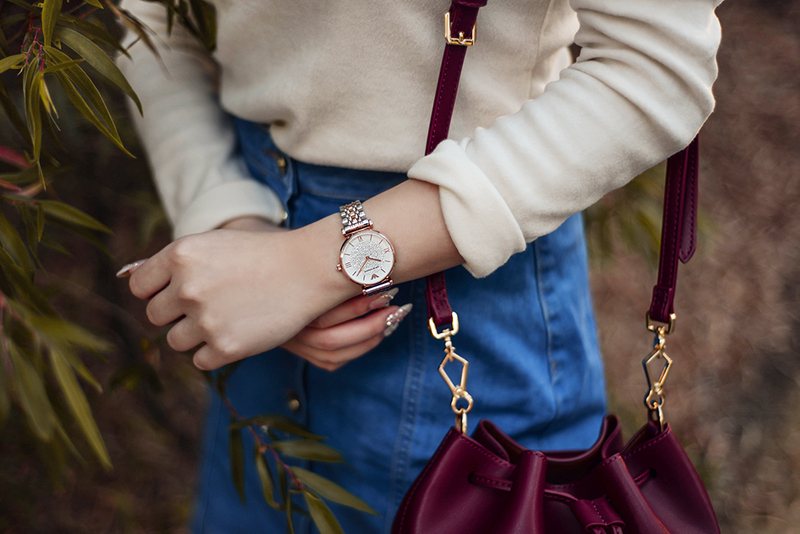 Surely time is transient and fleeting – but a special watch that holds time in its place is not. These ticking pieces keep your life on the ball, simultaneously showing you that life is above and beyond the seconds and minutes they quantify. They are investments that stay with you through life’s many moments and memories, making them with you as you go along. It also goes without saying that I firmly believe in a classic watch – one timeless and sophisticated like this other Gianni T-Bar. 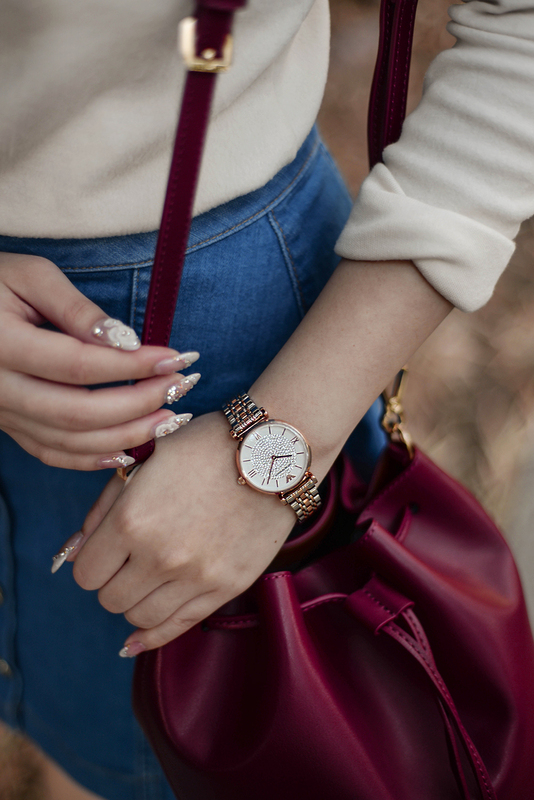 Bringing to mind a quintessential treasure, its white mother-of-pearl dial with centrally set pavé crystal stones is set apart only by its rose-gold plated case and bracelet. Certainly, such a characteristic design pairs with any outfit easily and effortlessly. 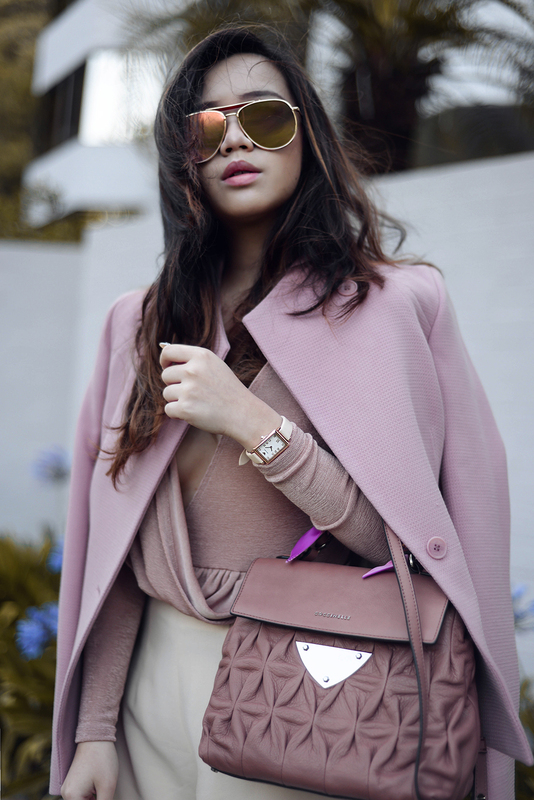 Its elegance is showcased even with the simplest of turtlenecks and light denim. Thank goodness for the holidays! ‘Tis the season to dress up.